Do all your little one's art projects come home covered in the epic colors of ROYGBIV. They are painted with watercolors, painted on clay pots, and drawn on school folders. It's no wonder, rainbows are super magical. On the darkest days, it's rainbows that arch over rivers and roads, painting the landscape in color. And what's more, you never know if you're going to find a pot of gold and a mini guy in green at the end of it! How wonderful! Has anyone ever told you that life wasn't all sunshine and rainbows? Well, now that you've grown up and you have a child of your own, you have to disagree. Sure, reality includes plenty of dark storms but those dark moments simply make the following sunshine brighter. And hey! How would the flowers grow if it wasn't for the rain? If your little one is the type that can celebrate a rainy day as well as a sunny one then your kiddo will enjoy this cheerful costume. It's a celebration of both the sun and the rain with cheerful colors and fluffy clouds on the end. Whether your child is in the school play, in a parade, or dressing up for Halloween, this tunic with a black background is sure to add plenty of cheer! 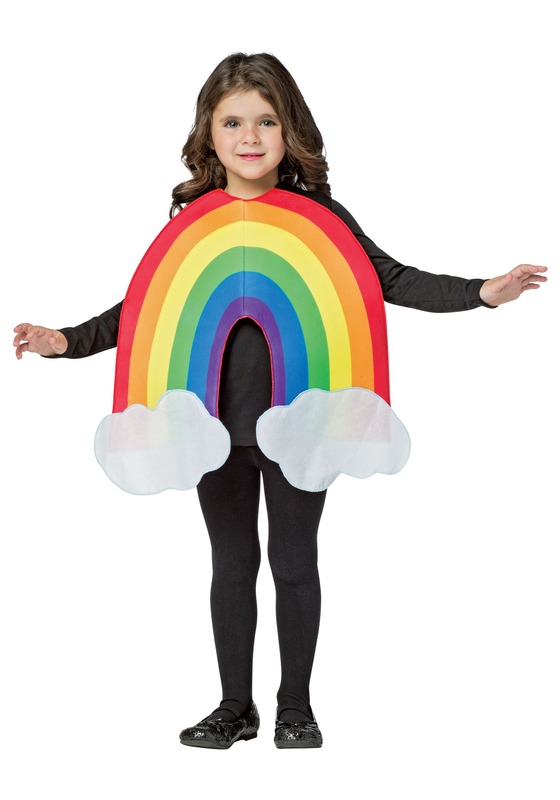 Dress a little brother or sister up as a leprechaun to put together an adorable group costume. There's nothing quite as fun as chasing after a rainbow, especially when it's your child who is dressed up as that gorgeous sign of sunshine to come!